In 1972, two seconds are added to time, worrying 11 year old Byron no end. Especially worrying is that he doesn’t know when it will happen, just that it will. Then, one day in a rush to get to school, his mom takes a shortcut through the local estate. Checking the time, because his father will not be happy if they are late, he sees the second hand move backwards. He tries to show his mum at the same time as his mum hits a young girl with her car. She doesn’t notice. He does. She drives off and he doesn’t say anything, setting off a chain of events that mean their lives, especially his will never be the same again. Eventually Byron tells his mom, who tries to make amends, bringing her into contact with the girls mum. As someone from the estate, she is not their class of people and, jealous of what Byron’s family have, takes advantage of the situation. Byron’s mom will do whatever she can to stop her husband finding out. Appearances matter to him. Slowly, the veneer of respectability she tries so hard to maintain cracks with tragic consequences right through to the present day. 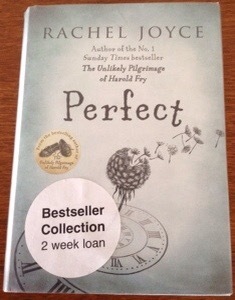 This is the second novel by Rachel Joyce; her first was The Unlikely Pilgrimage of Harold Fry which I’d enjoyed but found a bit too twee. I’d read good things about Perfect so decided to give it a go and am really glad I did. It is a book that I found easy to read but one that says a lot about how regret can shape us, as can the need to appear to be something we aren’t. I found myself thinking about the characters after I put the book down for the night, and after I had finished the book. Definitely more to it than initially meets the eye and a recommended read.